Emergency food and water are the basic building blocks of any survival kit. Our prepacked food rations and drinking water have a shelf life of five years. Sold by case sizes. Survival fishing kits are an easy means of getting yourself some calories. Prepackaged and ready to start fishing right away, theses essentials are a must when putting together your kits. 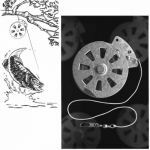 The autommatic fishing yo-yo will catch fish for you while you do other things. Place a few or even a dozen of them out and dinner will be there when you check back.